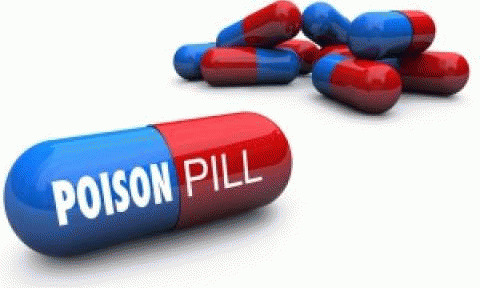 Government by Poison Pill: A Bold, New Model? Only a brave contrarian defends a poison pill concoction conceived in cynicism and promoted with panic that staggers home with all the climax of a shotgun wedding. Once an orphan chick ostracized by all, fiscal sequestration has arrived, though only left-leaning curmudgeons take sufficient note. "Economic terrorism," pipes up Thom Hartmann, but liberal metaphors are so whimsical. No such excess from know-it-all Ben Stein, declaring the Sequester a "ringing endorsement of the Republican Party," that rare leg-up by the self-admitted stupid party against a charismatic president. Talking Points Memo offers more nuance: "Democrats Come Up Short In Sequestration Standoff." "Short" barely covers it, since whose prestige wasn't halved after cutting government off at the knees? Ornery Republicans surprised Obama by not negotiating (say what? ), winning the kewpie doll and snapping the president's win streak. So, this one-time dreadnaught sails into port, fires its $85 billion salvo, then vanishes from view like a vapid TV flop. Can we not gain lessons here, after divvying the good from the bad? Two weeks ago, the Great Sequester loomed like an asteroid smash-up, a self-made WMD. Now Congress and Obama are so dazzled they've endorsed the package wholesale until September. The stopgap calm before the next storm, and perhaps something worse. Compared to government shutdowns, however, a stopgap with a sell-by date resembles decisive action, extending our rousing adventure with government by poison pill. Thank goodness, we bypassed weeks of tiresome acrimony. This magical mystery tour just happened, sans high indignation or low shots. Why, here's a viable alternative to governance, captivating tax tightwads who scour scripture for "Decry taxation as theft." Remember, the nation that won't learn from impaling itself on it own petard is doubly cursed -- suffering the downside without any upside. As the wise chief ends Little Big Man (when his dance of death fizzles), "sometimes the magic works, sometimes it doesn't." 1) Action Trumps Flummery. First, the undervalued obvious: something like change happened with amazing ease, just one "Abracadabra." No postponements, no filibustering, no Senate shenanigans, no irascible House votes that gave the majority a middle finger. Not since the Wall Street bailout has anything happened quicker. That's because America returned to our roots, took charge of destiny and dispatched all divisive debate for pragmatic action. Thus, no bluster, no doom and gloom, no outrage. After all, what never should have been done was done, and the sky didn't fall, nor the earth tremble. Behold the miracle. 2) Humanity Conquers the Future. Furthermore, sequestration proves, far more convincingly than End of Days chatter, that ordinary mortals can triumph over time, even the future. Lawmakers agreed on a plan, allowed it to age, then released it from its cage. If not quite the audacity of hope, is there no glimmer of optimism against our menacing future? Politicians we elected cobbled something together then, without obvious gain to anyone, demonstrated "a promise made is a promise kept." We stand aghast our leaders didn't flip-flop, re-deal, re-jigger history, even gush with lies. The sequester is that rare triumph of ultimatum over acumen, of expedience over judgment, yet a small testament we are again a "can-do" culture. To paraphrase the modern Oscar Wilde, Donald Rumsfeld, we fought the deficit with the messy sequester we had, not one that never existed. Why shouldn't this success carry over to other sticky impasses, like Iran or North Korea? We just fix hard standards years in advance, set the penalties for failure, then blast the evil-doers resistant to sensible conditions. If sequester shock and awe proves anything, here's a model with limitless (and predictable) applications. Didn't Teddy Roosevelt suggest we should sequester quietly, then carry a louder stick? 3) Bipartisanship Trumps Brinksmanship. If today's right has mastered anything, it's addictive, edge-dwelling brinksmanship. And yet, here's merry bipartisanship performed with such ease one only hopes a few conservatives learn that politics goes beyond shrill crusades. A guy can hope. Bipartisanship in and of itself is no panacea, but a marvel is still a marvel, even when covering an iron fist. Yes, sometimes a hard deadline, plus NOT voting, beats the flummery passed by huge majorities. The scariest Washington event is when unanimity, in the heat of the moment, anoints the next invitation to disaster (invasions, bailouts). As democracy itself falls hard by the wayside, laced with Constitutional ailments, let us take solace we pulled back from another cliff, putting off the inevitable. Maybe that's why so many feel suspended in air. 4) Congress Works. Countless pundits, with nauseating regularity, write how Congress is broken, busted, kaput -- a bunch of deadbeats swimming upstream, dragging medieval protocols. Congress let something happen that didn't topple the ship of state, nor shock the stock market or bond vigilantes. "Not much" progress exceeds what all but 15% of us expect from Congress. And imagine, it was Dubya who evoked the "soft bigotry of low expectations." Any lower expectations and we'd berate this goon show as negligent, cowardly aversion. Consistency is such a hard master. 5) Law of Unintended Consequences. Resist as I may, the law of Unintended Consequences explains best why we're beset with ungodly fiascoes. Whether war, foreign affairs, or economics, our imagined or planned outcomes not only fail to come true, but deliver sneering calamities that mock all expectations. Dire results are shockingly unpredictable, perversely opposite to declarations or promises. Everyone agreed, "warning! the sky will fall," yet here we are, paying homage to the Lord of Unintended Circumstances. Not only did wizards conceive the sequester NOT to be enacted (soft bigotry indeed! ), no one knows the ripples ahead. Is that not the god of chance offstage, cackling loudly? One wonders why politicians took so long to discover the joy of a close-ended, leveraged cannon. Perhaps poison pills just get a bad rap? Was it a weird bait and switch, without the switch? Silence defaults us again to Rumsfeld wisdom, especially "unknown unknowns," what "we don't know we don't know." This sequester qualifies in spades, for no one has a clue what we don't know that we don't know, ad infinitum. The future is the future because it's chockablock with unknown unknowns. Who said Rumsfeld couldn't be whimsical, too? I concede problems, even my glorious justifications for loving the Sequester at times appear to conflict with each other. The messenger need not be a logician, after all. All I modestly assume is silver could line the cloud just below the bottom, even with unsought unknowns. Failure can be a greater teacher, with this inevitable opportunity: dead ahead are countless episodes to experience which "unknown unknowns" are blessings and which deliver wickedly sharp, unintended consequences.